I’ve been deliberately and consciously shopping my own wardrobe since 2009. During that time, I’ve learned a lot about the ins and outs and ups and downs of it. 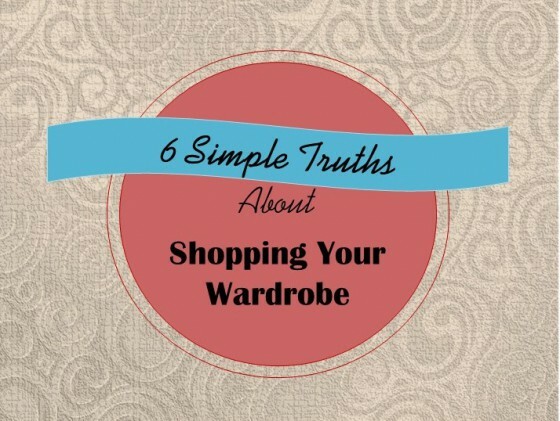 Here are 6 simple truths about shopping your wardrobe. 1. Shop your wardrobe is most importantly an attitude. Shopping your wardrobe is a way of thinking and feeling about your wardrobe that has you appreciating and using what’s there, not wishing for things that you don’t have. You can cultivate a ‘shop your wardrobe’ attitude overnight – there’s no special skills or steps required. The main ingredient you need is a new lens or a fresh set of eyes to look at, and experience, your existing wardrobe through. 2. Shop your wardrobe is about cultivating a working wardrobe. This type of wardrobe is one filled exclusively with items that make you look good (if not great) and feel even better. This kind of wardrobe is created by being conscious about every purchase you make, so any new item coordinates with many existing items, and pays their rent in your wardrobe. A working wardrobe that you can shop in is full of items that suit your body, support your lifestyle, and express your mood and personality. A working wardrobe that you can shop in usually takes a while to develop and get right, years sometimes. But it’s worth it. 3. When you shop your wardrobe, you have the chance to tap into your personal style. When you stop the ‘incoming’ (by stopping or slowly down the shopping you do in real and virtual stores), what you have left are the items you already have. By bringing your focus solely onto those items, you have a chance to define for yourself what you truly love when it comes to clothing and style. When you shop your wardrobe, you have the opportunity to explore and liberate your own sense of personal style. You can’t tap into your true style when you’re always shopping in the stores. I truly believe that true style comes from a connection with yourself – not from a constant purchasing of new items. That’s why fast fashion and its disposable approach to wardrobing is so antagonistic toward the cultivating of an authentic personal style statement – there’s too much noise going on, you can’t possible hear what your inner style voice is telling you! 4. When you shop your wardrobe, you make less shopping mistakes. When you shop your wardrobe, especially if you do it for a while, you truly do liberate your sense of personal style. You come to know – deeply and truly – what you love to wear, and what makes you look and feel great. So when you do choose to shop in the stores, you’re clearer. You’re less susceptible to passing trends or compelling marketing and merchandising. You’re more centred in your own style. So you make less purchasing mistakes. Because you are so attuned to your personal sense of style, you have discovered, through a deep connection with your existing items, and trial and error, what you love – and what you don’t. 5. When you shop your wardrobe, you discover what makes your heart sing about the existing items in your closet. When you shop your closet, you have a great opportunity to explore and discover what about your existing items really works. What items make your heart sing and your body feel alive. What items make you feel most YOU. And of course, what items don’t pass muster. You can’t do this if you’re constantly shopping and bringing new items into your wardrobe. There’s simply too much noise. When you shop your closet, you have the opportunity to evaluate items in your wardrobe. What do I absolutely adore? What makes me feel a million bucks when I wear it? What feels a bit daring, a bit exciting, a bit sensational? What makes me feel “Oh YES – I’m the me I want to be, wearing this!”? What items of clothing do I love, and what ensembles (combinations of items worn together) do I love? What items would I buy again today? (so many of the items in our wardrobes we keep simply because they’re there, we already own them. If we had to choose again to buy them, we probably wouldn’t). When you shop your wardrobe and explore your sense of personal style, where you often wash up is with a cultivated and curated “working wardrobe”. And this kind of wardrobe truly works for you. You use it. It isn’t a museum but a working and workable space, where every item in it ‘earns its rent’. Your wonderful working wardrobe may have 26 items in it or 66 or 1066 – it’s not the size that counts, it’s whether every single piece is working for you. I encourage you to consider a period where you only shop your wardrobe – whether it’s a week, a month, or longer. You may be surprised and delighted at what you discover.